I put together a quick and simple version of the basic vegan food pyramid that will help you prepare a healthy diet for your kids. You can take this food guide and make small adjustments to fit your needs and preferences. If you sit and watch children at a playground today, it’s frightening to see how many are overweight, many dangerously so. Many parents probably just don't realize that the convenience foods they feed their kids are not giving them any nutritional benefits whatsoever. 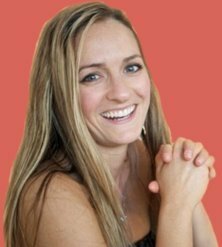 If you are coming to this page trying to find solutions for your own overweight children, you have come to the right place. There’s nothing healthier than a well-balanced plant-based diet for your children. Most vegan food pyramids are designed for adults, so there are some adjustments you will need to make along the way. As a general rule, when your children are younger, they will be on the lower end of the recommended amounts in the above pyramid, and as they grow, they will need more. Once they become teenagers, they will probably spike and eat more than what’s recommended, and as long as they are a healthy weight, that is just fine. The serving suggestions I have listed for the following vegan food pyramid below are referenced from the Vegetarian Resource Group. To start from the base of the vegan food pyramid, 6 to 11 servings of anything seems monumental, but a serving is considered ½ cup of a hot grain or 1 ounce of a dry grain. For instance, if you have half a cup of brown rice with dinner, that is one serving. Most people will eat at least 1 cup of cooked rice with a meal, so you already get two servings right there. It isn’t as much food as it initially seems. To caution you about breads... if you are buying bread in a store, it’s crucial to read the ingredients. Not only will there often be non-vegan ingredients (whey, buttermilk, butter, honey), but there are often tons of other additives and preservatives, as well as artificial sweeteners. You do not need any of these extra ingredients. I look for clean breads free of any ingredients I cannot naturally read, and I look for bread with all “whole” grains. If it does not say whole, it has been broken down and split apart, which takes away from the healthfulness of the grain. Stay away from enriched or bleached anything; it's a sneaky way of disguising white flour that has no health benefits. Some of my favorite whole grains are quinoa, barley, spelt, buckwheat, brown rice, and rye. You can grind any of those grains down into flour for recipes, and you can cook them all to throw together a quick meal. Don’t be afraid of the strange names— they all cook quite similarly to rice and are worth a try. Your kids might find the textures different than what they are accustomed to, so either work it with a fun name (quinoa= plain pop rocks) and keep giving it to them, less and less disguised with sauces every time. This is an easy and fun category on the vegan food pyramid. Everybody loves fruits, even kids. You don’t need to pack your body with fruits, but you do need fresh fruit every day. Beware of packaged juice; not only are many not made from whole fruits and have additives, preservatives, and artificial sweeteners added in, but they tend to lose nutrients the longer it’s been since they were juiced. The best juice you can make is whole fruit thrown directly into a blender, whirled, and then poured into a glass that you drink immediately. Then it has no time to lose nutrients, and you don’t throw out any pulp or other parts of the fruit. My favorite blender of all time is the Vitamix, and I highly recommend it to anyone and everyone. The very best fruit you can eat is what is in season and available local to where you live. Have you ever noticed that all the tropical, sweet fruit comes from the super hot and humid environments? That’s because those fruits are cooling to the body. As much as a person living in New York might love pineapple, mango, guava, kiwi, and papaya, unfortunately those foods are going to do the most for your health when you are in the tropics on vacation. I hate that truth as much as anyone, and so I sometimes break that simple rule so I can taste those sweet fruits. Some of us are just meant for warmer weather! For overall balance and harmony within your body, it’s better to eat strawberries when you see them at your local farmers’ market in the early spring, raspberries slightly later in the summer, blueberries after that, then peaches, then apples, and so on. The obvious problem with eating locally and seasonally is what to do when it’s winter and not a thing is growing locally. That’s when I try to break out my store of frozen fruit from the summer. Those fruits, though out of season, are still more on par with what a person living in my particular neck of the woods should be eating. You too! You can also get into canning, preserving, pickling, and dehydrating fruits when they're in season so they're available out of season. Here’s another easy and fun category. Some people have problems with getting their kids to eat vegetables, but it’s all just a matter of continuing to offer them to your kids. I read that it takes 10 times of trying a food before the body starts to recognize and enjoy it. So, if you’re just starting your toddler out on a vegetable and at first he doesn’t like it, don’t force it, just try again later. If he’s an older kid, I recommend continuing to serve those same vegetables without pressuring him to eat it until he starts to develop a taste for the food. Some of the healthiest vegetables you can get are the dark leafy greens, and they tend to grow in the opposite cycle of when all those fruits are available above. When it’s cold, you can simply load your body up with lots of leafy greens like kale, collard greens, swiss chard, spinach, and other greens. They’re packed with calcium, protein, and vitamins. If you have trouble getting your children to eat these hearty greens, try juicing them with a banana and oranges and giving it a fun name like Green Monster. They will never be able to taste the greens when they're masked with the sweetness of fruit and it’s a great way to start adding them to their diet. It’s always best to eat an abundance of different colored vegetables throughout the day. Work in the bright orange carrots, butternut squash, and pumpkin with the reds of beets and radishes, the purples of eggplant and the greens of broccoli and zucchini. The more color, the healthier the diet. This category can be combined with the “fortified dairy substitutes” category easily, simply expanding to 4-6 servings total. Consider this the vegan calcium rich foods section of the pyramid, even though you get tons of calcium from the vegetables section as well. If you're looking for a nice substitute for dairy products, try my homemade fortified almond milk recipe. All beans and legumes have different health benefits and are great vegan protein sources, so here’s another category in which it’s smart to mix them up. Some people worry that as vegans they will have to eat an abundance of soy, and that’s simply not true. While some people do choose to use many meat alternatives when they are new to the vegan lifestyle, many more use that as a simple jumping ground to a fake meat-free diet. I personally get freaked out when a meat-alternative tastes too much like what I remember of meat. On the other hand, my husband thinks those fake meats are amazing. To eat a balanced vegan diet, eventually it’s best to transition away from fake meats and to focus more on whole beans and healthy soy products like tempeh and tofu. There are so many ways to manipulate beans into purees, spreads, dips, patties, and balls, that you will have no problem making them a part of your everyday diet. I love nuts and seeds as snacks, and they can also be whirled into amazing sauces and cheeses to accompany your entrees. Learn all about the health benefits of flax seeds for you and your growing family. These should be used sparingly, to aid with cooking and as occasional treats. As a general rule of thumb for a healthy vegan diet, about 20% of your calories should come from fat. For growing children, you might expand this to about 30% of their calories from fat. When you focus on eating the whole versions of grains, vegetables, fruits, and beans, you will have no problem staying within those caloric guidelines, even including the occasional vegan dessert. The USDA guidelines updated their food pyramid in 2010 and it actually aligns somewhat well with the vegan food pyramid. They adjusted the meat section to be called “meat and beans.” They say to “go lean on protein,” which I read to mean: don’t obsess over eating lots of protein like people have been led to believe in the past. They also say to vary your choices of protein, with more beans, peas, nuts and seeds. Their wording is vague, which could be because they know that meat simply isn’t doing anything for our health but that they don’t want to come right out and snub the meat industry by saying so. They do a good job of showing the oils column as very slim and saying to get fat from nuts and vegetable sources and to limit solid fats. They say to focus on fruits and to eat a variety. Agreed. In the “Milk” category, they say to get calcium-rich foods, suggesting low-fat or fat-free, and “if you don’t or can’t consume milk, choose lactose-free products or other calcium sources.” They never flat out say to drink milk, nor do they suggest any other calcium sources, which are plentiful in nature. I wonder what industry pressured them to be incredibly vague on the blue section? In the grains category, they say to “make half your grains whole.” There is absolutely no reason why all of your grains should not be whole. This again feels like pressure from the food industry because such a small percentage of the market currently lists “'whole’ before the grain name on the list of ingredients,” as they suggest we do. It’s such a small percentage that in a regular grocery store it’s not uncommon to be unable to find one loaf of bread or package of crackers or pasta with “whole” as the first word in the ingredient list. If you take the time to read the www.ChooseMyPlate.gov page, you will see that they have explained more about each section and they provide some good vegan protein sources and nutrient sources. They still wimp out incredibly in the in-depth milk section. My guess is that all the studies on how cow’s milk is bad for our health didn’t make it to the review board. Overall, at least the new USDA guidelines make a jump over those that stood for the past decade and seemed to encourage heavy consumption of meat, eggs, fish, and dairy products. 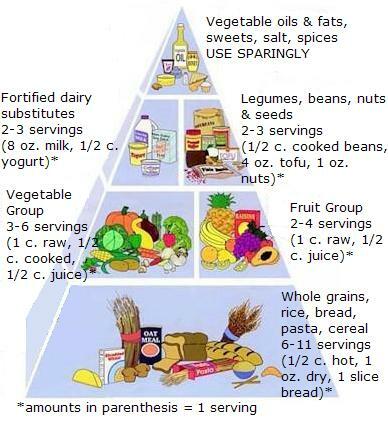 You can also check out Your Vegan Guide for another version of the food pyramid. It's a great website with tons of vegan information, as well as a different take on the same concept of the vegan food pyramid.